In recent years, a growing number of econometricians, statisticians, and climate scientists have analyzed observational climate data and results from climate models using econometric methods such as cointegration, change-point and transition analysis, dynamic panel methods, and structural time series models. Econometric interest in climate change and its complex data environment has grown to the point that it can be considered a developing field within econometrics. 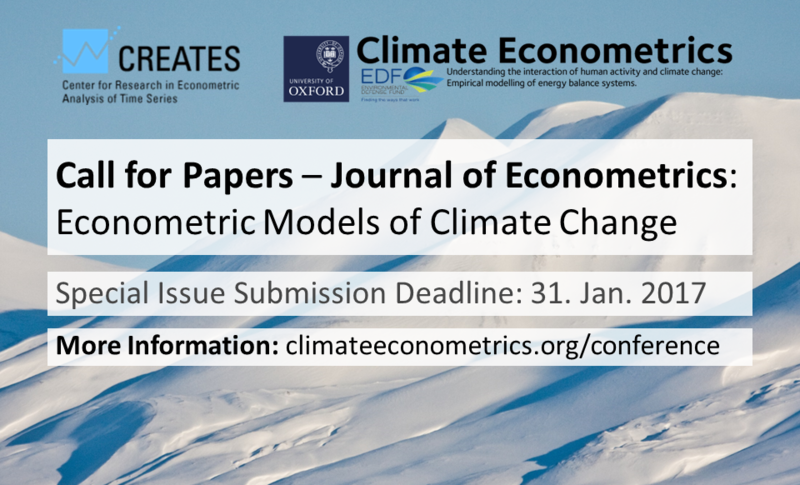 We are inviting contributions to a special issue of the Journal of Econometrics on “Econometric Models of Climate Change”. Deadline for submission is the 31. January 2017. To submit your paper: Follow the Journal of Econometrics submission procedures: in step 2 of the submission (here), you find a drop-down menu “Category of Submission” that defaults to “Regular Submission.” Submit by selecting further down in the menu by choosing “Annals: Climate Change Aarhus 2016 (Hillebrand)”. The special issue will be guest-edited by Eric Hillebrand, Felix Pretis, and Tommaso Proietti. The next conference on econometric models of climate change will take place in Oxford, on September 4th-5th, 2017. More details to follow in early 2017. We solicit submissions of papers whose novelty stems from the development and introduction of new econometric methods to models of climate change, while at the same time ensuring that the way these econometric tools are applied take into account the underlying physics of the systems being modeled. We particularly welcome submissions in the field of climatology highlighting interesting statistical challenges to which econometric methods can contribute (e.g. correction and homogenization of time series). Applications should improve our understanding of climate or the impacts of climate policy.